Tis the season to watch holiday films — there seems to be more options this year than ever before. 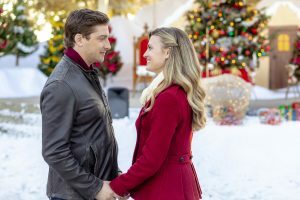 We can always count on Hallmark Channel to spread the joy and the Christmas cheer with a myriad of majestic movies designed to entertain fans of falling in love when there’s snow outside and houses are decorated with mistletoe, trees and stockings on the inside. In Christmas in Love, Brooke D’Orsay plays a shining light of a character. The very happy Ellie Hartman lives in a small town in Missouri, works with her family at a bakery that specializes in creating Christmas Kringles desserts. And she’s a crafter on the side. Things start to get complicated when an uptight corporate exec in the form of Daniel Lissing‘s Nick Carlingson comes to town to assess the efficiency of the bakery. He might even have thoughts of automating the business which would mean a loss of many jobs. Nick and Ellie meet cute, then immediately clash. But will the cold sparks turn into something hotter? We caught up with the movie’s lead actress via email. D’Orsay filled us in on her character, revealed the best part of filming the flick, and told us what it was like to work alongside the always dashing Lissing. We may have even hit the way back machine to discuss one of her previous Hallmark projects. TV Goodness: In Christmas in Love you play Ellie Hartman. Why are viewers going to love this character? Brooke D’Orsay: Ellie is a kind-hearted girl, wants the best for everyone, and is relatable in the way that sheâ€™s trying to overcome her fear of following her bliss. I think thereâ€™s something interesting about a girl who is super grateful for what she has, and because of that, is scared to shoot for more. TV Goodness: Why are they going to root for Ellie and Nick? D’Orsay: I think we see from the beginning that there is something between Ellie and Nick. They have a bumpy road â€” he has lessons to learn, and she has fear to overcome, but ultimately we see that they love each other and belong together. 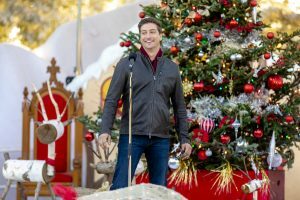 TV Goodness: Talk about working with Daniel Lissing â€” how much fun did you two have on set? D’Orsay: We had so much fun! Daniel is one of those people who can make friends with a rock, and every group needs someone like that to bring the team together. Heâ€™s very playful, spirited and funny. He made the set a really happy place. TV Goodness: What do you remember most about filming Christmas in Love? D’Orsay: The gorgeous location! The Christmas festival set was right beside a gorgeous lake. We filmed in the summer, so we had a snowy set right beside a summery beach. It was a magical site! TV Goodness: Where did you film it? And what did you enjoy most about the location? D’Orsay: We filmed this movie in North Bay, Ontario which is a small town about four hours north of Toronto. Shooting in a small town made for such a nice bonding experience with everyone on the film. Since options were limited, we all ended up planning activities together as a group during our time off. It was really wonderful. I will always have fond memories of this film and everyone who was a part of it. TV Goodness: Whatâ€™s your favorite scene or moment from this film? D’Orsay:My favorite scene is when Ellie finally steps out of her comfort zone and takes a risk! Not only does she express her feelings for Nick, she also asks him to help her pursue her dream. TV Goodness: Ellie works at the bakery but she has this other dream she wants to pursue â€” did this happen to you at all with your career? Did you start on one path and then get into acting? Or was acting always your Plan A? D’Orsay: Acting was always my Plan A. When I started acting I purposely didnâ€™t give myself a Plan B, because I thought in doing so, I was setting myself up to fail. I wouldnâ€™t necessarily recommende that advice though! TV Goodness: How good a baker are you in real life? D’Orsay: Um. Not good. Well, I shouldnâ€™t say that. If you like your baked goods dry and burnt â€” Iâ€™m awesome. TV Goodness: Ellie lives in the small town in Missouri but has aspirations about moving to San Francisco. If you had to choose one, would you live in a big city or a small town or suburb? Why? D’Orsay: Tough question! I actually canâ€™t choose. In my own life, I have the advantage of both. I live in LA, but my family, whom I visit often, lives in a small town. I recently bought a place there because I love it so much. TV Goodness: Whatâ€™s your all-time favorite holiday movie and why? D’Orsay: I will always love A Christmas Story. Itâ€™s a movie that I have watched since I was a kid so it just kinda feels like home. TV Goodness: I recently saw How to Fall in Love, a Hallmark movie you did a few years ago that also starred Eric Mabius. It instantly became one of my favorites. What do you remember about your first Hallmark film? Photo Credit: Copyright 2012 Crown Media Holdings, Inc./Photographer: Eike Schroter. D’Orsay: It was such a wonderful experience!!! I loved making that movie so much. I remember being very nervous about being a lead in a film, and I still feel so grateful to Hallmark for helping me overcome that fear. And grateful to the supportive fans! TV Goodness: Where else can we see you? What other projects are you working on? D’Orsay: Iâ€™m developing a TV movie right now. Hopefully this time next year you will be able to see what Iâ€™m working on! 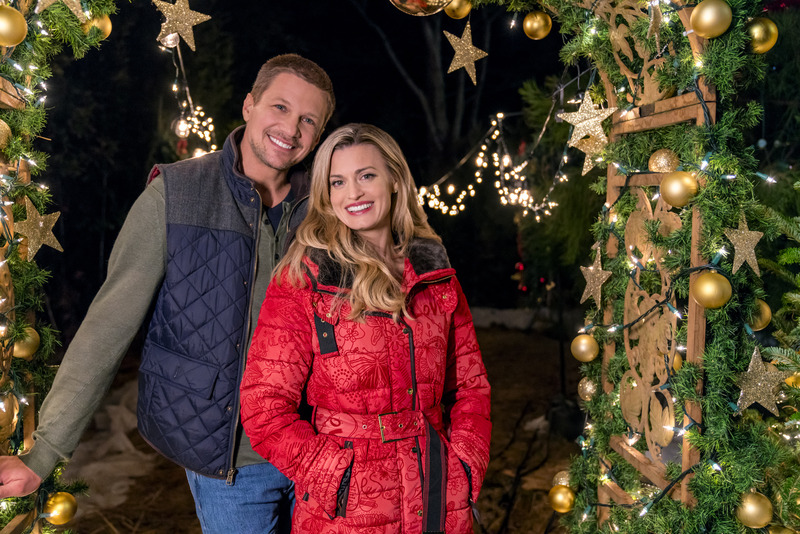 Countdown to Christmas continues with Christmas in Love Sunday night at 8/7c on Hallmark Channel. Keep checking hallmarkchannel.com for additional airings all Christmas movie season long.